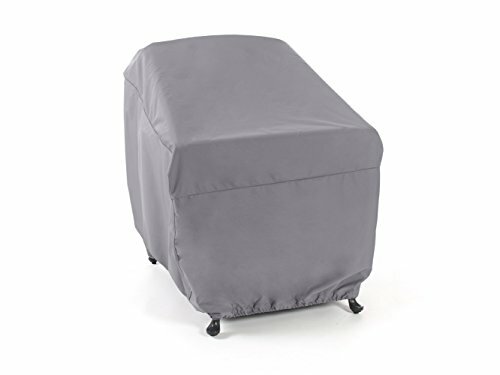 CoverMates Elite Outdoor Chair Covers are the smallest chair covers we sell. They're designed to protect patio chairs that have a standard height but a smaller length and width. The Elite collection of chair covers is made from 300 denier polyester fabric that has been specially treated to repel precipitation and protect your furniture against harmful UV rays. Unlike other covers, our Elite material is light in weight and won't become stiff in colder climates. These covers were designed with a variety of special features like a built-in mesh vent that allows air flow needed to block mold and mildew, as well as a drawcord locking system and two buckle straps in opposing corners that secure the cover in place while providing a snug fit and look. All CoverMates Elite chair covers come with a three-year manufacturer warranty so you can purchase with confidence.